Flash website has the power to invoke an emotion or excitement. It's amazing what one can do with such graphical tools. With Flash Websites visitor on the website is not just given the information but they are provided with some excellent experience. 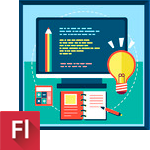 Flash based websites are more interactive in terms of their presentation. We also develop flash based components like Flash Maps, Flash Graphs etc. We offer low cost flash website designing.